What are the most popular times of year for travellers visiting Iceland? How can you secure the best chance of avoiding the crowds at this country’s most beloved natural attractions, and what are some of the country’s lesser known sites? Read on to find out all you need to know about avoiding the crowds in Iceland. Hoping for tranquility? See The 7 Best Spots for Peace, Quiet & Silence in Iceland. Hoping to immerse yourself in Iceland's landscapes? Book Nature Tours here. Learn more about Yoga in Iceland here. Okay, granted, the crowds discussed in this article do not reflect the vast human traffic of, say, Times Square in New York City or, perhaps, Piccadilly Circus in London, but instead the hordes of visitors often found accumulating around Iceland’s most beloved natural attractions. Indeed, Iceland’s population can be described as diminutive at best, though statements like that give no credence to the sheer number of foreign visitors in Iceland at any given time. Nor does it get across the fact that Iceland’s major points of interest are found with great swathes of land in between them, meaning you may see little traffic on the road, but a whole host of people at your desired destination. The same applies for the Icelandic capital, Reykjavík, which is widely known to contain two thirds of the country’s population. The fact of the matter is, Iceland’s major shopping district, Laugavegur, is but a single street, and whilst efforts are forever being made to expand and dilute the downtown area, it is still this one road that draws the majority of pedestrian traffic. Following vacation trends across the world, Iceland is, naturally, far more popular during the short-lived summer months, from mid-June through to August. The winter season is generally considered to be from October to March or April (sometimes extended from September until May), with many travelling to Iceland during this period with the primary intention of seeing the Northern Lights. Regardless of the peak numbers per season, however, it is, without doubt, the summer that sees the greatest influx. During the summer, the Midnight Sun keeps Iceland illuminated for nearly 24 hours day, allowing guests to really maximise their time in the country, drawing out the length of their days and visiting a greater number of attractions. The temperate weather also makes visitors far more comfortable driving greater distances, as well as allowing them the opportunity to visit locations otherwise inaccessible during the winter. Iceland's most popular sightseeing routes, without doubt, are the Golden Circle—comprised of the UNESCO World Heritage site, Þingvellir National Park, Haukadalur Geothermal Valley and Gullfoss Waterfall—and the picturesque South Coast, where visitors will stumble across black sand beaches, cascading waterfalls and incredible observation decks. Because of their popularity, visitors to both regions can expect crowds of one description or another at each of the attractions along these routes. This is quite the opposite when we're dealing with some of Iceland's harder to reach areas, regions that are often overlooked due to their distance from the capital. One thing to keep in mind, however, if you are looking to beat the crowds, is that you will need to leave the Capital Region in order to escape a dense population. The Westfjords are, without doubt, Iceland’s least visited region, a reality primarily due to its distance from the capital and lack of urban development. 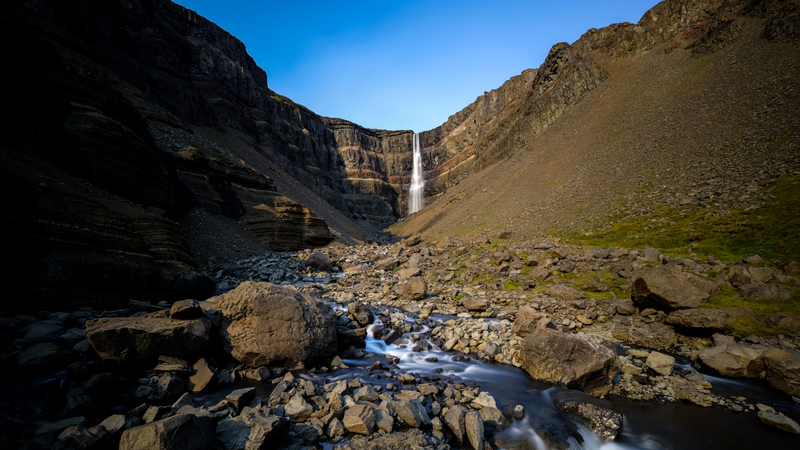 In other words, the Westfjords is as close to an untouched Icelandic paradise that one can get, a region of staggering mountains, beautiful waterfalls and rolling meadows. Thankfully, there are still plenty of attractions in which to visit dotted all across the Westfjords. On the region’s southern side, travellers can pay a visit to the beach, Rauðasandur, famed for its golden red sand (something of an enigma in Iceland) and on sunny days relatively temperate waters. Wikimedia. Creative Commons. Credit: ProgressChrome. 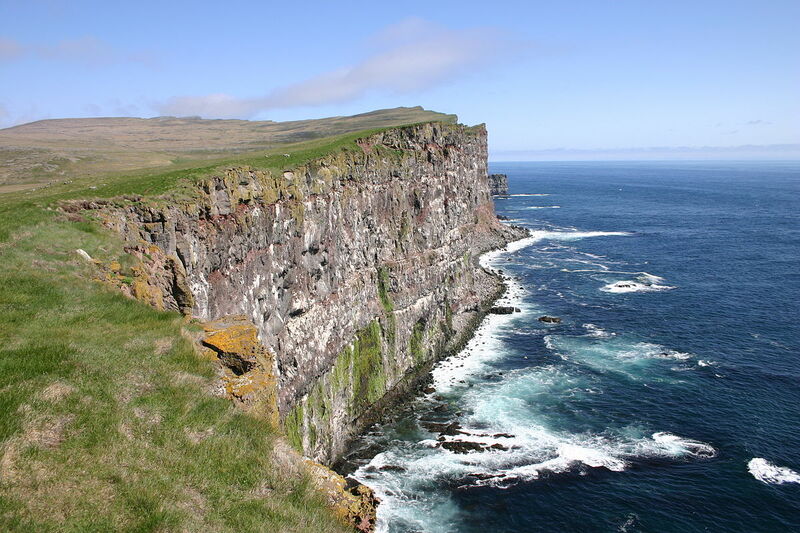 In the same area, it is worthy to make a stop at Látrabjarg cliffs, the westernmost point in Europe, where you will be able to enjoy the sight of thousands of nesting seabirds. The region’s capital, Ísafjörður, provides a touch of civilisation, as well as boasting some of the oldest buildings in the country. From the town, it is possible to partake in a variety of exciting tour activities, including horse riding, kayaking and hot spring hunting. The Interior Central Highlands are only accessible during the summer months. This is due to the loose gravel roads that navigate the area, and the unsuitable condition in which they end up during the harsh, snow-filled winter months. This makes visiting the Highlands in winter an impossibility, save perhaps a flyover during a helicopter sightseeing tour or by paying an obscene amount for a specially made monster truck mission with an extremely qualified guide. The Highlands are best known for their scenic hiking trails, particularly Laugavegur, which leads from the kaleidoscopic rhyolite hillsides of Landmannalaugar ("`The Pools of the People") to the Valley of Þórsmörk. Laugavegur is considered to be the country’s premier hiking trail (though does cause some confusion, given that its named after the capital’s main shopping street). But why are the Central Highlands so highly regarded by trekkers? To start, this is a region of extremes; sitting over 500 metres above sea level, the highlands contain Iceland’s tallest mountains and it’s largest glaciers. Vatnajökull, the country’s largest glacier, can be found in the southern highlands, whilst Hofsjökull and Langjökull are located closer to the centre. To put this to scale, Iceland’s tallest mountain peak, Hvannadalshnúkur, is located directly beneath Vatnajökull ice cap. Hveradalir is a geothermal valley in the Highlands; approaching this area, visitors will experience great steam stacks as they filter across the site’s burnt hillsides. Visiting areas such as Hveradalir is one of the optimum ways of gaining an insight into Iceland’s geothermal underbelly, as well as seeing firsthand the elemental battle between ice and fire. Known as “Iceland in Miniature” due to its wide and eclectic range of attractions, the Snæfellsnes Peninsula makes for a fantastic one-or-two day trip and provides a sure fire method of avoiding the crowds. There are a vast number of attractions worthy of a visit on the Snæfellsnes Peninsula. Most notably is the domineering stratovolcano and glacier from which the National Park takes its name, Snæfellsjökull; this incredible feature will forever be within sight whilst on the peninsula, ever growing on the horizon line as you approach the region's tip. On this tip, visitors will also find one of the region's other major highlights, Kirkjufell, otherwise known as Iceland's most photographed mountains. Keen viewers of HBO's fantasy television series, Game of Thrones, will recognise Kirkjufell as "the mountain like an arrowhead" from 'beyond the wall'. 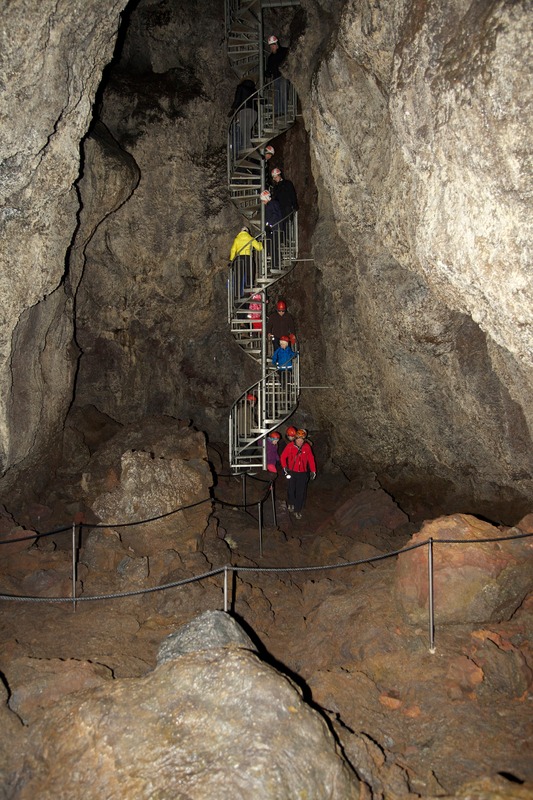 Another worthy stop is Vatnshellir Cave, an 8000 year old lava tube that stretches a total of 200 metres at a depth of 35 metres below the surface. Entering this subterranean chamber by a spiral staircase, you will be immediately taken with the fascinating rock formations, stalagmites and stalactites, breaking the darkness with the beam of your headlamp. Ytri-Tunga is a stretch of shoreline known for its resident seals, making it one of the most reliable spots for seal spotting in the country. The only species that pup on the island are Harbour Seals and Grey Seals, though it is not uncommon to see rogue species such as Harp Seals, Ringed Seals, Hooded Seals and Bearded Seals, all of which tend to normally reside in the arctic. Though it shouldn’t be expected, it is also sometimes possible to spot Walruses on the Icelandic shoreline (2013 has boasted the greatest number of walrus sighting to date). Saxhóll is a volcanic crater found on the peninsula’s westernmost tip, found 9 kilometres south of Hellissandur. The crater is roughly 100 metres high, with an adjacent walking path, making this a perfect stop for those who wish to sightsee, but don’t want to partake in too much hiking. East Iceland has a number of its own fantastic attractions, more than worthy of a visit for those enthusiastic enough to make their way eastward. It is also the only region of the country where it is possible to see herds of wild reindeer, initially introduced in the 18th century in a failed attempt to bolster animal-rearing on the island. One of the most dramatic sites, Stokksnes Beach, is home to the mighty mountain, Vestrahorn, known colloquially as “The Batman Mountain” due to its pointed peaks, making it a personal favourite for visiting photographers. Egilsstaðir is the largest town in East Iceland, though is still young by Icelandic standards, having only be founded in 1947 as an administrative centre for surrounding rural districts. Today, the town boasts a college, hospital and an airport, cementing its place as the go-to town of the east. Hengifoss is surrounded on sides by basaltic strata, in which it is still possible to see the dark red clay trapped between the rock layers. This is what gives Hengifoss its distinctive colouring. It takes approximately 45 minutes to an hour to hike to Hengifoss. Hallormsstaðaskógur is Iceland’s largest National Forest, covering 740 hectares and containing two campsites, a hotel, horse and boat rentals and a number of picnic spots. There are also over 40 kilometres of marked trails leading through over 80 different species of trees, allowing trekkers the opportunity to try their hand at mushroom or berry picking, or to dabble in a spot of birdwatching. When it comes to hot springs, you’re largely combatting others that have the exact same idea you do. Now, in an ideal world, almost all hot springers are looking to bathe in the company of their fellow travellers and are less-inclined to share a warm, moist space with strangers. Fear not, these strangers are likely thinking the same as you, pondering exactly what time will be best to visit with the ultimate ambition of earning a solitary soak. Well, in truth, getting this timing right is an increasingly difficult achievement, especially considering the rising popularity of bathing in the country’s natural hot pools. It is made harder still by the fact that, come day or night, a reason still permeates to visit; under the cover of darkness, bathers are often privy to a blanket of starlight and, sometimes, to the dancing green, red and white waves of the Aurora Borealis, whilst daytime visitors will enjoy the surrounding countryside in full luminescence. Arguably, it is at the ‘artificial’ hot springs, the luxury spas, where you will likely encounter the greatest number of fellow guests. The Blue Lagoon, particularly, is worthy of note, given that its popularity requires prospective guests to book weeks and even months in advance in order to secure their spot amid the steaming, azure waters. This, quite rationally, means that the Blue Lagoon is almost always working to full capacity, and whilst it is still an easy pleasure to relax at this spa, the notion that one will be alone is entirely unfounded. From Evening Golden Circle and the Secret Lagoon. 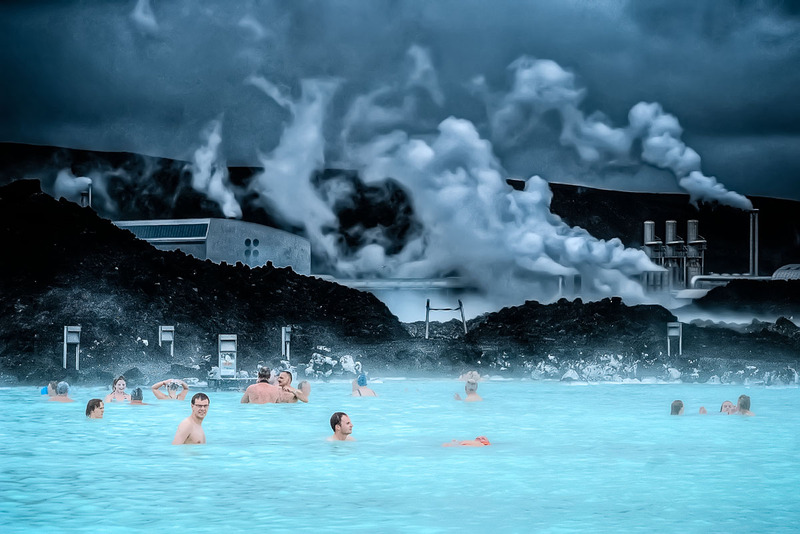 An alternative idea, and one that pretty much guarantees the absence of large crowds, is to visit one of Iceland’s other luxury spas, often considered to be worthy secondary option for those who don’t want to miss it. One example could be The Secret Lagoon, located in the town of Flúðir, only a short distance off the famed Golden Circle sightseeing route. The Secret Lagoon is the oldest pool in Iceland and is surrounded by active, steaming fumaroles and bubbling mud cauldrons, allowing bathers to gain an insight into exactly where this geothermal energy is coming from. Another choice could be the Mývatn Nature Baths, located in north Iceland besides the lake that shares it name. 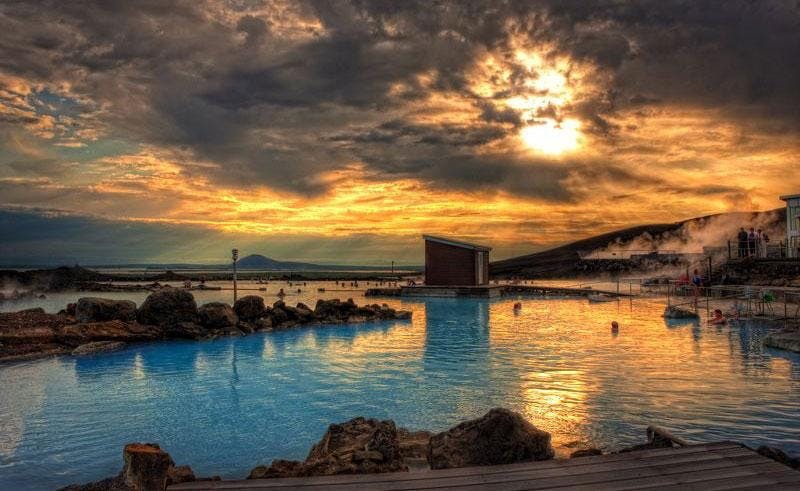 Whilst much smaller than its counterpart on the Reykjanes Peninsula, the nature baths provide the same level of soothing bliss, whilst, arguably, boasting a more sublime surrounding scene, complete with the still surface of the lake, cragged volcanic fields and far-off mountain peaks. Did you enjoy our article Avoiding the Crowds in Iceland? What areas and attractions did you find to be the most popular, and where did you go where you experienced total isolation? Make sure to leave your thoughts and queries in the Facebook Comment's box below.